Where do I begin? Today should be your 2nd birthday , today you should be in the arms of your family , today your legions of fans should be anxiously awaiting a picture of the birthday girl. Today is not what it should be, it is so different that anyone could have ever imagined. Heather, Mike, Grandma, Bampa and many others you are all are in my thoughts and in my heart today and always. I wish there was more that I could say or do to my make this day any easier for those who love you. All I can do is share your story with all those I know. I can laugh and cry while I remember the life of a brilliant girl with my group of friends who also fell under the Maddie charm. Maddie you are truly missed by so many , you are a light that will always shine bright in so many lives. Happy Birthday sweet Maddie, Happy Birthday. 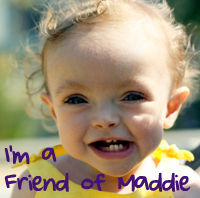 Please consider making a donation in honor of Maddie's birthday to Friends of Maddie. Magda you are so sweet and thoughtful. Very well written and thank you for sharing the story of Maddie with me. 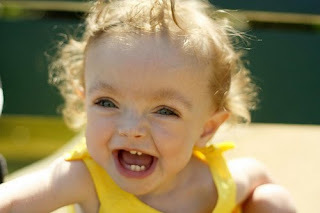 It has touched my heart and although I am not part of the legion of fans, I still get sad thinking of this beautiful little girl that I never met nor knew about till you introduced her to my life a number of months ago. There is so much love out there and support that the family of Maddie is lucky to have supporters like you and the many others out there like you. Perfect post. Simply perfect. It says it all. Beautiful post. Maddie touched so many hearts and will be missed by them all forever. You are missed and LOVED by so many. Very beautiful. Happy Birthday Maddie! We all love and miss you so much. It is nice to know there are so many people out there sending such love to Heather and Mike today and so many birthday wishes to Maddie.